Banana Wonder: Feeling bad for Greece? Commiserate with us this weekend at the OC Greek Fest! Feeling bad for Greece? Commiserate with us this weekend at the OC Greek Fest! 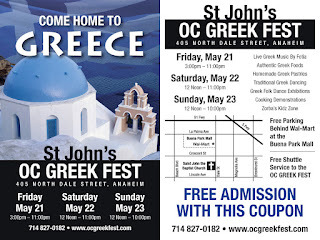 Come experience the sights, sounds and tastes of Greece at the 2010 OC Greek Fest: St. John the Baptist Greek Orthodox Church’s 49th Annual Greek Food Festival celebrating the food, music, and culture of Greece! Authentic Greek foods and homemade Greek pastries; traditional Greek dancing and Greek music (live music by Fotia); an outdoor marketplace and expansive 'Zorba’s Kidz Zone' with carnival rides; games and other activities for the children—plus more!—are all ready for your visit to Greece right here in Anaheim. Mall—Dale St. and La Palma Ave.—Shuttle Stop located behind Wal-Mart. Sophia - no worries, this is just the beginning of Greek fests - there will be plenty more coming up! Opa!